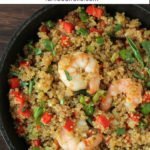 Quinoa Stir Fry is an easy weeknight dinner of shrimp and quinoa tossed in a wok just like fried rice. All you seafood lovers in the house rejoice! This shrimp recipe is for you. It is a quick Chinese style fried rice recipe that substitutes quinoa for rice making it truly healthy. Definitely, something to try out if you’re looking for a gluten-free and a wholesome dinner recipe to toss up within minutes. Is Quinoa better for you than rice? 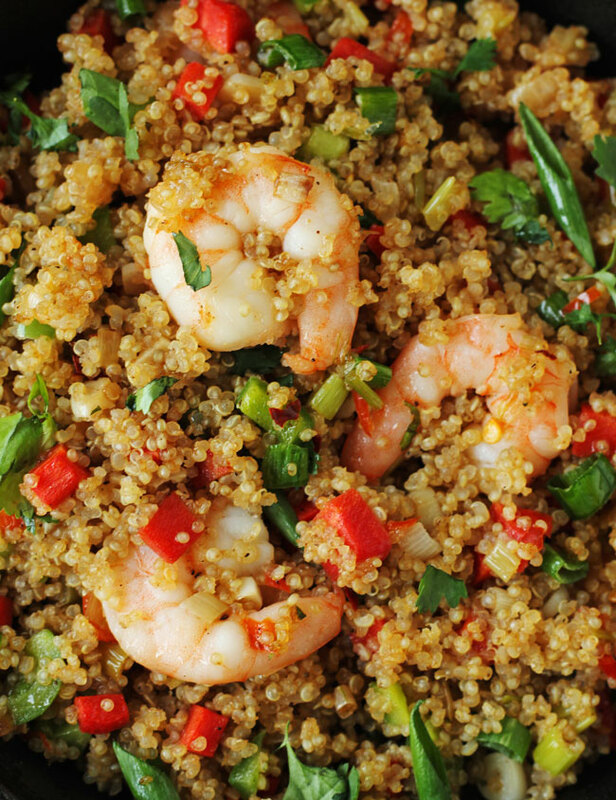 Quinoa is high in protein, fiber, and low on carbs. You can make it a part of your daily meals if you want a filling grain that has a low glycemic index. Whereas, white rice or any polished variety of rice has much more calories and carbohydrates than a cup of quinoa. Hence, if you are looking for a healthy substitute of rice – quinoa is the answer. The process of cooking quinoa is somewhat similar to rice. Quinoa grains have a slightly bitter flavor to them. Washing the grains thoroughly under running water(or as you would, rice) gets rid of this flavor. Once rinsed, you can either cook it in a saucepan with water or pressure cook. 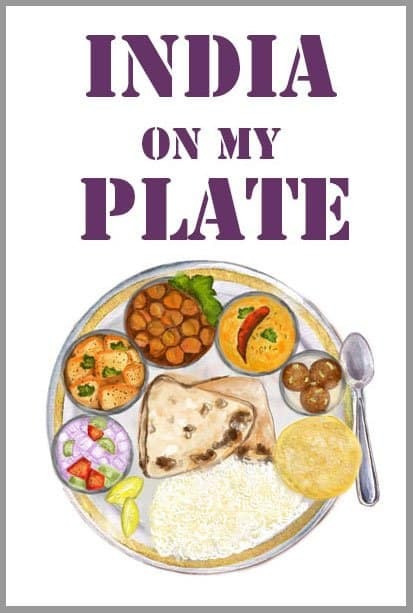 It takes about as much time as rice to cook or even lesser depending on the quantity. It usually gets done in about 15 mins max over the gas stove. Once cooked, drain the quinoa in a colander and fluff it using a fork. Who can say no to a Chinese takeout-style dish which is healthy too? Nothing like curling up with a big bowl of this quinoa stir fry, catching up on our favorite Netflix show with Momo by our side. This is our way of unwinding during the busy weekdays and we only get up to serve ourselves seconds (or thirds) of this yummy dish. 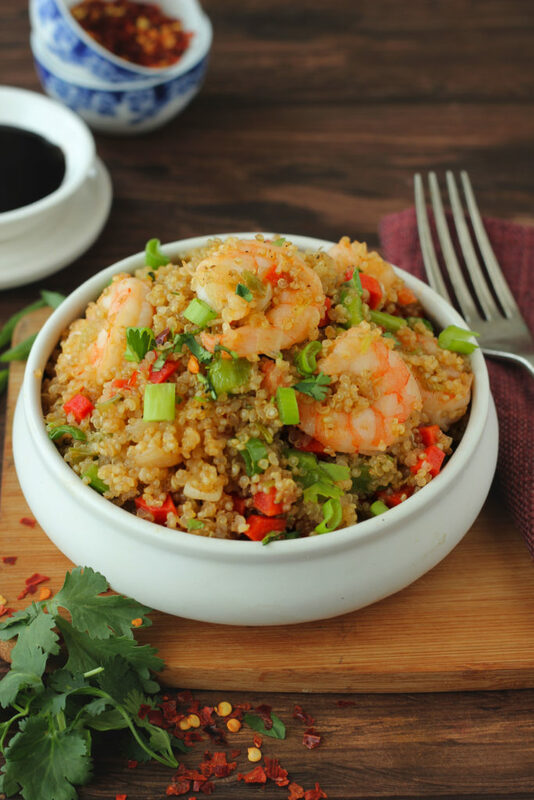 This shrimp quinoa fried rice is healthful, fun and will have you coming back for more. Not all of us have access to fresh prawns, especially on a weekday. Frozen prawns are fine to use in this fried rice recipe. Just follow the package instructions to clean them and prep them. If you’re buying fresh prawns, most supermarkets clean the prawns on request. Or you can clean them at home if you have time on hand. Most cuisines prefer prawns with their tails because certain recipes demand it. For quinoa fried rice I have used shrimps without tails. An issue often faced with seafood, most kinds of fish, in particular, is the smell. You can marinate the shrimp with some fresh lemon juice if you want no traces of odor. 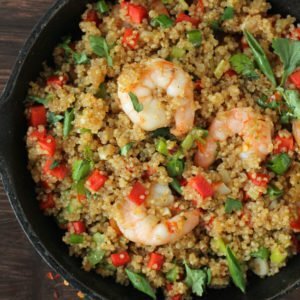 Quinoa Stir Fry is an easy weeknight dinner of shrimp and quinoa tossed in a wok just like fried rice. 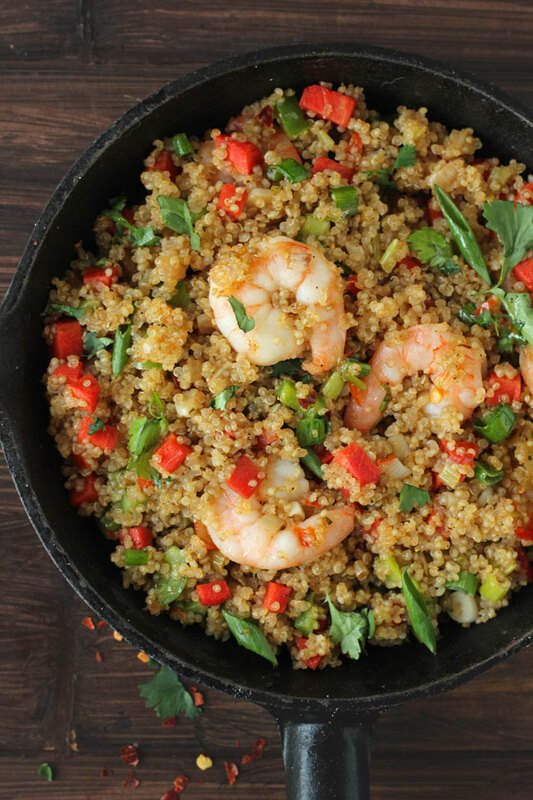 Learn how to make shrimp fried rice with quinoa in a few simple steps. In a saucepan, boil 6 cups of water. Add a pinch of salt. Add quinoa in the boiling water and cook till tender. Stir occasionally and keep checking for doneness. Once quinoa is cooked as per your liking, transfer to a sieve or colander. Drain water. Fluff quinoa using a fork. Set aside until required. Heat oil in a stir-fry pan. Add chopped garlic, ginger, and onion. Stir-fry over high heat for a minute or so. Next, add chopped vegetables and stir-fry for 2 - 3 minutes. Add the cleaned shrimps, salt, and pepper. Cook till shrimps turn light pink in color. Add vinegar, soy sauce and stir fry for a second. Now, add the cooked quinoa. Mix nicely. Taste and adjust seasoning accordingly. Garnish with chopped spring onion greens. Serve quinoa stir fry warm.